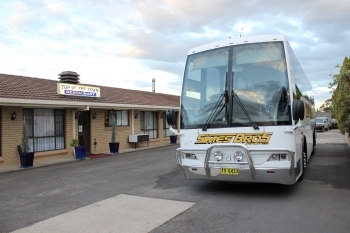 Coach Tours - Inverell Accommodation - Top of the Town Motel - Ground floor rooms with room service, restaurant, full sized pool, and undercover parking. 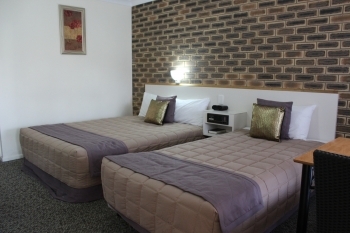 Located on the quiet western edge of Inverell this 3½ star motel has 21 ground floor rooms featuring queen and twin rooms and larger two bedroom suites, sleeping five. 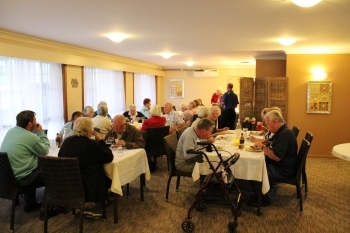 Our licensed a la carte restaurant has a good reputation for steak and seafood dishes, seating 50 people comfortably. If you prefer, room service is available in your room. Special menus are arranged for coach groups. Relax in our outdoor salt water pool. Inverell is know as the "Sapphire City" and is situated on the Macintyre river. Popular local attractions are wineries, the Inverell Pioneer Village, Transport Museum, Copeton Dam, Sapphire fossicking, Beaulieu Olive farm, amazing shopping and lots more. 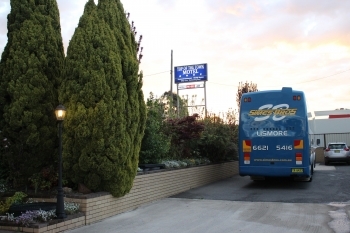 Experience country hospitality at is best at Top of the Town Motel, Inverell.